1982 VW Vanagon Westfalia for $13,000! Are you looking for a home away from home? Well then, Nice Price or Crack Pipe has a VW that will make you one happy camper. Yesterday's double trouble Bentleys brought out the gray poupon in you, garnering a Nice Price majority on both of the mighty blighties. Today, we're going to think inside the box. Bartles & James Bentleys for $14,950 and $29,950! The VW Vanagon is that box, with some wheels underneath to keep it from scraping its junk. And it's a pretty slow box at that. Representing the last generation of the Wolfsburg maker's rear-engine bus models for the U.S. market, it continues to this day to have a bit of a cult following. Add the Westfalia-Werke camper conversion and you're ready to go all Uncle Von Rico on your bad self. The Vanagons have always lent themselves to engine swaps, with various shades of Porsche six slotting in with little effort. The later wasserboxer busses added the necessary plumbing to accept new hearts from makers who didn't still cling to the old ways of air-cooling and double-digit horsepower. That means you might find one with a Subie WRX pancake shoved up its bum. Or, even one VW's own diesel fours for folks who enjoy MPGs but hate MPH. 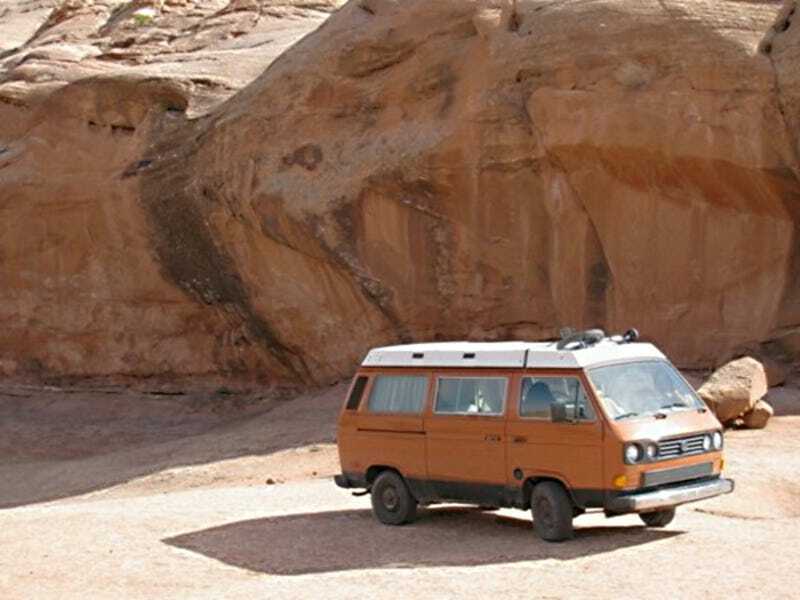 Today, we have an orange and brown '82 Vanagon for a desert heat-induced $13,000. Now, that questionable amount may seem insane if it was still dragging around the original 1.9 litre, 95 bhp, horizontal huffer, but it's not. No, the flat four has been replaced with a Tiico 2.0 A2 inline four, canted over at 15°, and good for a claimed 135 ponies. If that doesn't pop your top, it also has the Westfalia package which will do that for you! That's right, the massive, center sunroof has been sacrificed for a fiberglass and cloth pop-up roof which allows for stand up headroom around the built-in stove and sink, and a raised sleeping platform to keep you safe from bears and horny toads. Not part of the package is any kind of bathroom, so you'll have to trailer one of Andy Gump's famous blue monopostos for when you need to drop the kids off at the pool. Another missing link is A/C, which could be a deal-killer what with all this talk about global warming. So, for all you unibombers and Into the Wild wannabes, what do you think about this pumpkin-colored people mover? Is $13,000 a Nice Price for a car that you could potentially live in without feeling like some kind of homeless freak? Or, like so many homeless freaks, is that seller smoking the Crack Pipe? KSL.com or go here if the ad disappears. Mad props to Jo Schmo for the tip.